After the Prom Post cover, May 25, 1957. Atelier Ettinger Inc. issued After the Prom, a twelve-color lithograph, in January 1977. Measuring 24 by 26 3/4 inches, the edition consists of 295 impressions on papier d'Arches. 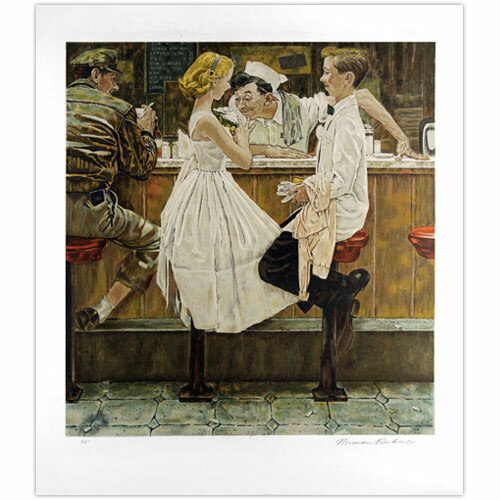 200 were numbered and 60 artist proofs were singed in pencil by Norman Rockwell. An additional 35 prints, pencil signed and designated with roman numerals, were reserved for the artist, and 25 deluxe prints were printed on Inomachi Nacre (Japon) Paper. This May 25, 1957 Post Cover succumbed to Rockwell's desire to caricature; "I call this my chinless picture," he said. He constructed the scene in his Main Street studio and then photographed models with fitting profiles.